Aloha! I’ve decided to start a new blog series to talk a little more about my art and what it means to me. Today I’m focusing on my flower art. One of the things I love most about Hawaii is its plentiful Hawaiian flowers. I’ve fallen in love with all of the tropical flowers that surround this island, which is why you can find them in a lot of my paintings of flowers. Heleconias, hibiscuses and plumeria art are just a few of the many I love to paint. These beautiful flowers remind me of just how effortless it is to be inspired by all of Hawaii’s natural beauty. It’s easy to fall in love and stay in love when you’re constantly surrounded by such magnificent works of art all at the hands of mother nature! Stoked to announce my newest collaboration Turkish towels with Hoa Kai ! 4 new limited edition designs are now available! We did our first collaboration together about a year ago, and I LOVE these towels so much, we always have a few in the van or my truck as they are lightweight, soft, absorbent and super beautiful! Only 225 of each design were produced so they will be gone fast! You can check these beach towels out, along with my other available beach towels as well! In 2009 my husband Chris and I started Green with Aloha, a line of durable and useable goods meant to help people get away from the normal habits of very common disposable items (mostly plastic). We started with 1 tote bag design and 1 water bottle design. Since 2009 we have made 6 different tote bag designs, 4 water bottles and 3 different re-usable travel coffee mugs. Well today, I am so HAPPY to unveil our newest tote bag! The Green With Aloha Wave Tote is here!! Stoked to announce that one of my projects in the studio the winter has finally become public! I created a new piece called Hula Girl for the 2017 Odaiba Hawai'i Festival held just outside Tokyo each year. This is the largest Hawaiian festival in Japan each year showcasing the beauty of Hula, Hawaiian music, art, and of course, great food! Tonight is the full harvest moon so it is an extra special way to kickoff your weekend of fun! 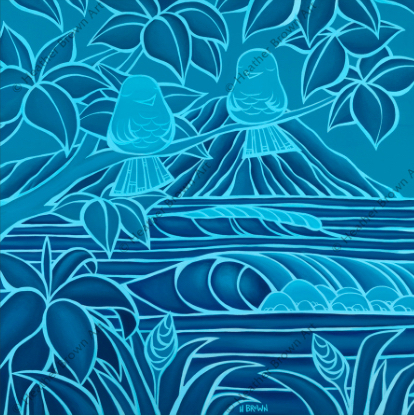 The full moon over Waikiki reminds me of one of the pieces I created entitled "Midnight in Waikiki" Two easy going birds enjoying the sound of the surf, views of the iconic Duke Kahanamoku Statue, the bustling tourists all while Diamond Head fills their background sky. If I could, this is how I would spend my evening tonite watching the harvest moon. Its ALOHA Friday! I hope you all enjoy your weekend! I am pleased to announce that we have just added two new rope handle tote bags to my collection of reusable shopping and beach totes! The first, which inspired the collection is "Waikiki Coastline"